Having listened to two talks by Steve Hughes, ex CEO of A Rocha, a Christian Environmental Charity on how we can reduce our carbon footprint (Living Lightly) and how we can be eco-friendly with what we eat I have been inspired to eat Vegetarian every other day. It is not as difficult as it may seem, with lots of cookbooks offering vegetarian recipes to be cooked within as little half an hour and at lunch every day having cheese in my sandwiches rather than meat. Stir fries can be cooked with Tofu, readily available in Tescos and Tofu if fried and reduced down takes on a texture similar to meat I find. Hopefully by cutting down on meat I will be reducing carbon output through farming. Also reducing a risk of cancer, heart disease and alzheimers (there are links between too much sodium nitrate which gives pork products their pink colour and alzheimers). Caroline Hodges has done an excellent guide on Ethical Purchasing including foods which is widely available in Trinity. One of the suggestions that came out of Steve Hughes ‘Food for Thought’ talk was that Trinity could go further and have a Corporate Purchasing Policy in which we as a church buy home grown and ethically produced meat and other products. As an organisation, we have bigger purchasing power than an individual alone and could organise a cheaper deal for ourselves. Other good suggestions were that any BOGOF (Buy one get one free) deals at the supermarket the “free” product could be donated to our foodbank. As an individual living in a one person household, I am frequently overwhelmed by supermarket deals benefitting families which are simply too heavy to carry or too wasteful to purchase. As we know, much food is wasted and it is good to know that some of it at least can be passed on to those in greater need. The Landport Tenants Resource Centre is now sporting a café which is open every Friday from 5 to 7pm stocking food leftover from the Landport Food Bank alongside tea and coffee and visitors are asked to give only what they can afford as they leave. When food shopping, don’t forget to pray! Entrust the Lord to help you purchase wisely and economically. It has worked for me many times, including when I asked for my weekly shop not to go over the £40 mark and indeed it came in at under that !! After all: John 6 vses 10 – 12 says ‘ ..the men sat down, about five thousand of them. Jesus then took the loaves, gave thanks, and distributed to those who were seated as much as they wanted. He did the same with the fish. When they had all had enough to eat, he said to his disciples, “Gather the pieced that are left over. 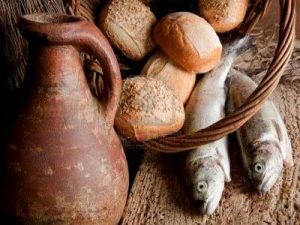 Let nothing be wasted “.’ What an economical and supernatural Lord we have, that he can make provisions out of virtually nothing, and will not let us go hungry: “ I am the bread of life. He who comes to me will never go hungry, and he who believes in me will never be thirsty” (John 6 vs 35).